Every once in a while I find myself with too much ripe fruit—more than can be eaten before it goes bad. Like the other day…too many peaches! I know that almost seems impossible given my deep love for summer peaches. But maybe that’s why I buy too many when they are truly ripe and then can’t eat them all. Solution? Cobbler. Many years ago, probably even before this blog was born, I experimented with different cobbler toppings. They were utter failures! All too soggy: The topping would sink into the fruit and become mush. A good cobbler topping has to be crunchy! I remember even cooking the topping separately. (What a whole lot of trouble that was!) So I’m not sure why this topping worked so perfectly and easily…except that it did. It didn’t sink into the fruit, and it tasted totally yum—hot and crunchy (although you have to be careful not to burn your tongue). I have lots of visions of adding nuts, seeds, ginger, spices and other ingredients on future cobbler toppings, but as with a good pair of jeans or a perfect black dress, one has to get the basics right to put together something great. 1. Preheat oven to 350 to 375 degrees. 2. Clean and cut the fruit (unless it’s berries, which you can leave whole). I left the peach skins on, too, myself. 3. Add the fruit to a casserole dish (you can put it all in one casserole or in individual little dishes if you want to impress your guests at a dinner party or something like that). No need to butter or oil the pan. 4. Toss the fruit with a bit of lemon juice. I used half a lemon, but you can use more (or even add some zest!). The lemon juice keeps the fruit from turning brown. 5. In a separate bowl, mix together the topping ingredients. Mix until all are coated in butter. 6. Sprinkle the topping mixture on top of the fruit mixture. Place in the oven and bake for about 30 to 45 minutes, or until the fruit is bubbling and the topping smells delightful. Serve à la mode with vanilla ice cream or any flavor you can imagine will taste yummy with your fruits. Add some whipped cream if you’re really feeling fabulous. Enjoy! 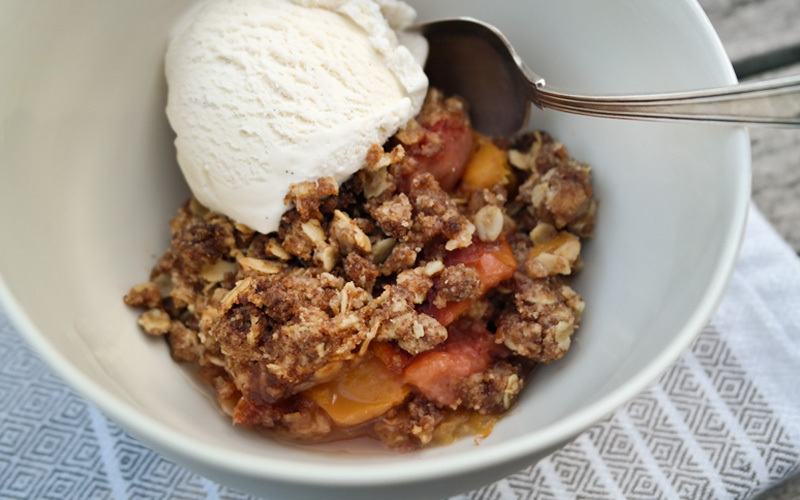 5 Responses to Quick and Yummy Basic Fruit Cobbler, This Time Peach! If I could magically (and invisibly) appear at your table, I would love to be one of the 6 that this delicious dish will serve. But I guess I’ll settle for drooling over the picture! Looks so good!! Maria, thanks for sharing this delicious recipe. Do you ever have to add a thickening agent to the fruit? And if so, what do you recommend? Best Wishes! This sounds much more like a crisp, not a cobbler…sounds good though! Thank you for sharing this recipe, Maria. I made it last night with a mixture of blueberries and blackberries for my brother, who was visiting from Indy, and he went bonkers over it! So simple. So yummy!